I don’t respect kings who start their statements repeatedly with “Puhaha”. That can’t be a good sign, neither for their intellect nor for their ability to win hearts and minds of their subjects. To be honest, I find it downright ridiculous. In the mission “Last Stand” we have such a king. Revived Priam he is called, and this revival thing was surely a big mistake, not only for the Greek but also for the Trojans. No people wants to have a king riding on a sort of snouty monster contraption and starting his speech every time with “Puhaha”. Phase 1: Until the first mini-boss, the Cursed Minotaur, spawns (about 34 min mission time left). Phase 2: Until the second mini-boss Scylla spawns (about 24 min mission time left). Phase 3: Until the final boss, Revived Priam, spawns (about 14 min mission time left). Phase 4: Until the final boss is killed. Generally you move as fast as you can. Phase 1: One mercenary stays to kill the initial mobs at the north-west and south-west gate and then joins the rest, which destroys as fast as possible the summon portals to the north-east and then north-west including all the mobs in the boss area. Then you kill the first mini-boss (Cursed Minotaur). Phase 2: If you have not finished to take out the northern summon portals, continue to do so, then start in the south-east, going down to kill the south-east summon portal, then the south-west summon portal, then kill Scylla. Phase 3: Do some cleaning work if there are any stray monsters left. Otherwise move to the boss area and wait for “Puhaha”. Phase 4: Kill the boss. Generally you stall during phase 1 and 2, you use up all the time you have. Phase 1: Your sheriff gets sethed and kills the two monsters near the north-west gate. Then she kills the one monster near the south-west gate. In the mean time your cannon main and your oracle kill the monsters near the north-east gate. When they are finished the oracle sethes the cannon main one last time. Then both separate: the oracle hastes back to the sheriff to lend her seth’s will as soon as possible while the cannon main defends the south-east gate. The sheriff kills the spawned mini-boss. Phase 2: The cannon main finishes defending the south-east gate and lays traps before this gate (not inside but outside the fortress). Then all move to the south-west gate and make ready for Scylla. The cannon main should be nearest to the spawning point, the rest a bit back. When Scylla spawns, the cannon main shells her (or lures her with a hit) and a somewhat messy battle will ensue. Phase 3: Scylla is dead. Don’t stall anymore. Move in normal speed. Now you secure the south-west gate with lots of traps and move your merry band to the north-east. There will be probably already gathered a lot of monsters who – being bored – knock at the gate. This is the one gate which may fall because you will fight your way through this gate down to the boss area anyway. Do so, kill all in your way. Look up how much time is left until the boss spawns. 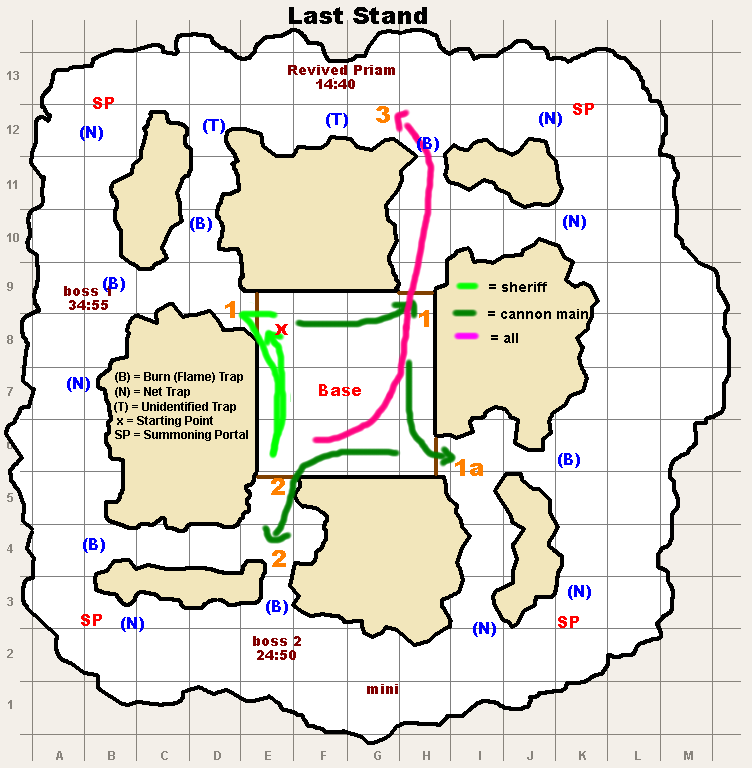 If there is a lot of time left, stall again, so that the number of turns between the moment that you have squashed the opposition and the moment when the boss spawns is (ideally) 1. If your oracle has time, sprinkle traps around. Later, in phase 4, monsters will enter the fortress and try to destroy the base camp – every trap may prevent a monster from doing so for one or two turns. Phase 4: Priam has appeared. Finish approaching his area and kill him as fast as possible. Stalling is meaningless now. Don’t bother to defend your base camp anymore. The base camp has 100 k hitpoints and the monsters will need a while to whittle it down. You are faster. Or so I hope. I know I am. I use a lot of traps. I try to lay 2 traps before every gate (outside of the fortress) but as you can see in my video it rarely works out that way. And the new miracle potions really help in critical situations. Buy some. The map is still incomplete and will going to change in the next days. I am sure I haven’t personally triggered all traps on it. I know there are other maps out there but I try to verify the trap locations on my own, if possible. So please be patient. The given spawn times in the map seem to vary. Sometimes they are correct, sometimes the bosses spawn up to 50 seconds later. When this occurs with the first mini-boss, the other will spawn later by the same amount of time. I am still researching why and when this happens. Been soloing last stand for a while now and this is the method i use ( CannonM , Sherrif & Oracle). 1. Once battle starts start moving cannon main to NE gate. Oracle will start to move after giving seth to sherrif to kill the 2 mobs that spawn there. Sherrif will take care of these mobs and then cata will proceed towards NW summon portal while sherrif moves towards the SW gate to kill the mob attacking the gate there. 2. Cannon main + ora takes care of the mobs at the NE gate and proceeds to the NE summon portal. 3. Sherrif kills the mob at SW gate and proceeds to destroy the SW summon portal. – . Move as fast as you can. Not slower than 25 seconds Faster is better. – Cata to stick to the left path to avoid the flame trap. 4. if the spawners are not down yet before the minautor spawns , not to worry continue hitting the spawner’s and bring it down. Withdraw , heal up if required and come back in. You start off at NW gate which is where the first mini boss Cursed Minotaur comes in. Kill the mobs there quickly and proceed to take care of the first wave. In normal scenario i loose the SE gate to the mobs. 5. Once the first wave is done, move cannon main + ora to the only remaining spawner i.e SE. 6. Put some traps before the second rush at the SE gate to delay the mob rush . 7. Once the second rush starts quickly kill the second mini-boss Scylla and then take care of the mobs. u have clip on youtube can show us? Another main for this map would be staff main. Recently vialled to staff and to my surprise managed to do exceedingly well in this mission. Seems to be a lot easier now in handling the mobs, though the final boss takes up a bit more time. Flame Blow is an awesome skill and the upcoming patch talent system that will make it even more stronger. On a side note , a sethed staff main one shots all the mobs there. Also , during my last run no gates were destroyed. This ended up being more of a headache as now the mobs were trying to attack from all gates. So this means that it is more beneficial that one gate gets destroyed so that all mobs come in through the destroyed gate making it easier to tackle the mobs / put traps. Coming from the stall-route I usually don’t give a damn whether mobs attack the gate or not. They do that only when I am well on my way to the boss. Let them break through and try to wittle the base camp down. In the meantime I have already killed Puhaha. When a gate was destroyed (and that happens quite often in my runs) the mobs still try to come through all gates. The mobs standing before a gate still up don’t move to the now open entrance but still try to get the gate just before them down. hi, i have a question, i hit lvl 130 a few days ago and i was wondering if i can solo mode this mision for the 4 phase homer quest, just solo, not in squad, im gun main, i have sheriff in lvl 129, and the usual oracle with max seth, what do you think? and thx for this page, its awesome. Doing it in solo mode qualifies also because your task is to kill Revived Priam, and that one appears as boss in solo mode Last Stand also. If you can do it in solo mode you must test out for yourself. It is very, very long ago that I did it in solo mode, and as far as I remember, it is much easier, but it wasn’t THAT easy for me then (squad mode solo run was nigh impossible at that time). That is weird. But all around in the outer ring are standing mini-bosses and normal mobs in not so modest amounts. If you enrage them (for example by wandering around and destroying summon portals) they get active and run to you. In the video shown you see that I don’t take out any summon portal. I take care that I won’t aggro any monster unnecessarily. And that worked fine so far. I had only one fail since I made this video, and that was because of a stupid mistake (which I won’t publish here because I want to maintain the good impression y’all have of me). It is only people with outstanding gear and very nimble fingers and thick cables into the core of the Internet who can do this destroying of summon portals thingy. I still can’t. And even if I could, I wouldn’t. It is much more comfortable and much safer to do it my way. You can even chat in the meantime with other people. if we dont take out Priam immediately, there’s a chance Athena coming, right? what did she bring on to the mission? Athena would kill all remaining mobs except the boss and his minions. But while I have experienced it a few times in the very beginning of my Last Stand experience, I haven’t seen her the last year or so. I just failed this in squad duo. My friend and I were both staffM. The problem was the very last wave, after taking care of dragon. when we both head to Priam, tons of mini attacked the base. Only sheriff + vamp was defending it but we failed. How come 8-10 mini attack u at the same time? Only strategy is going out and take care of SPs? What happen if defend all wave, including the tons of mini’s wave? will they keep coming, or will be there end of this so we can safely walk to Priam? As far as I know it you have two choices: Play very fast and take out all summon portals – or stall the whole time (as shown in the video). There are minis out there – if you aggro them (for example when you try to destroy a SP but you discontinue it because something else happens) they will come over you. The number of mini-bosses is finite. Besides the ones which are there from the beginning (not all are in my map, supposedly there is at least one on every side) there are some which spawn in each wave. But the summon portals themselves only spawn normal mobs. As staff mains you should search for johnfarson (or jfarson) at youtube. He has made a lot of videos for staff mains. His video about Last Stand is very good (but it is the fast variant which I am not able to do for reasons outlined in the article above). 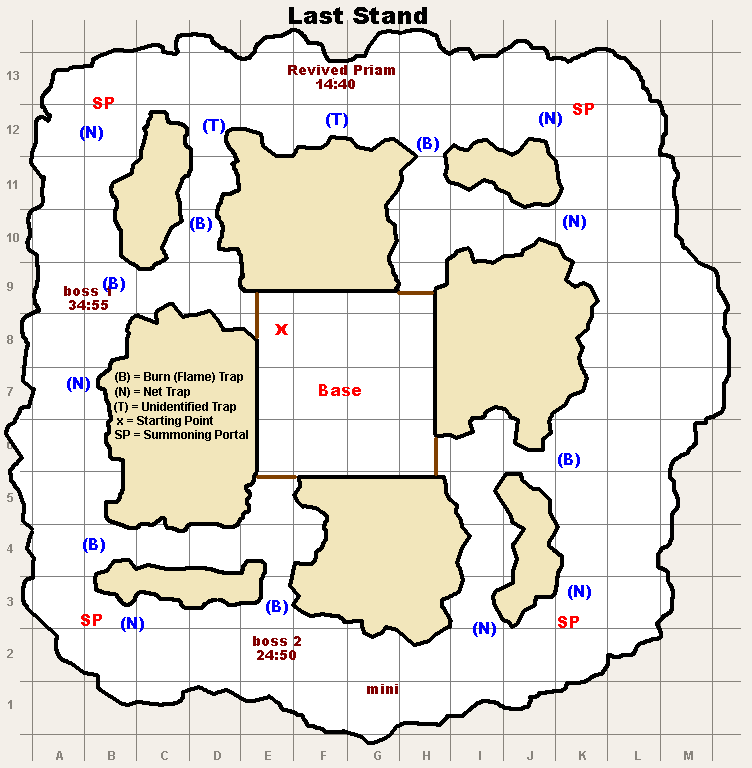 who can solo Last Stand with PSaw main ? Found out today.. The SP which is positioned downright spawns not a pair of usual mobs, but a miniboss! (Frightful Slaughterer). Tried to solo with cannon M 139, Druid 133, Oracle 138. Able to 1 hit any mobs by only using seth’s except melee mobs, mini bos, and final boss. The difficult part is when south-east gate destroyed, Scylla the second boss didn’t go through south-west gate but south east one that have been destroyed. He also bring many of his companions that overwhelming my squad. My questions, Is it true that if 1 gate is destroyed the miniboss and his minions will go through that destroyed gate? I don’t know if it is true because that never happened to me. As outlined in the article above my main lays traps (see step 2). That is enough to prevent the destruction of the gate. And Scylla goes nowhere in my runs. She spawns as indicated in the map (“boss 2”) and my sheriff stands already there, with cannon main and oracle close behind. So she gets attacked directly after she spawns. Does anybody know why in this mission, when I managed to destroy all Summon Gates mobs still seemed to be spawned from somewhere and came to flood my base from all 4 directions ? It was pretty easy, I used the summon gate kill strategy. Main Battlestaff. 1,2m might. I had money only for 2 catapults so only one gate killed , but good thing that bosses are mega weak against electron field and dies 4-5 turns.